42 Epic Battles - Now YOU are in command! 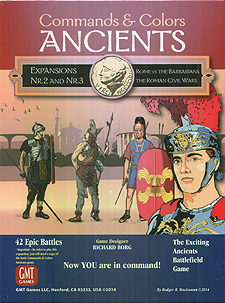 Commands & Colours Ancients allows you to refight epic battles of the ancient world. In this expansion the vaunted rebellious slaves, winning smashing victories, but also suffering some of their greatest defeats at Arausio and in the Teutoburger Wald. In this expansion see the formidable Roman army dividing and fighting itself as Julius Caesar, conqueror of Gaul, and Pompey, his former partner in the Triumvirate, contend for sole control of the Roman Empire. Units in both armies can only move and fight when ordered. The command playing cards supply those orders, providing an element of luck that creates a fog of war and presents players both challenges and opportunities. You must maximise your opportunities by playing your command cards judiciously. How well you handle the diverse units, their weapons, and the terrain, will determine victory. In order to play this expansion you will need a copy of the basic Commands and Colours Ancients game.